I made this guitar cake for my husband’s 50th birthday. 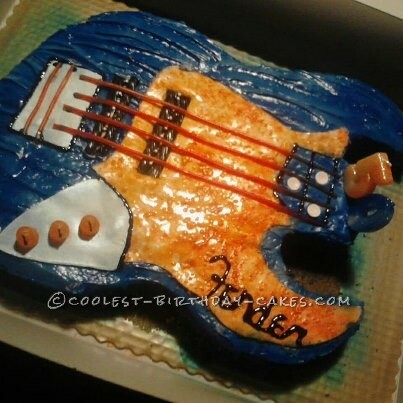 He plays bass guitar, so I wanted to make it as close as possible to the real deal! I drew a template of the shape and all the details of the pick ups and bridge, etc. His favorite flavors are chocolate and cherry, so I made the cake chocolate and the icing was cherry flavored and colored pink! I sprayed the cake blue and colored the fondant orange for the Denver Broncos football colors. (My hunny’s favorite team). Everything on the cake is completely edible! It was the funnest cake I have made to date! I was so excited to see the look on his face when he seen it, and it was worth all the sneaking around I had to do to pull it off! And of course it was delicious! Our kids passed through the kitchen throughout the decorating and they were totally impressed. I will continue to challenge myself to make better and better cakes. I have also been asked to make cakes for my friends and other family members, I am looking forward to doing so! Birthday cake idea Posted by Justine H.